Here we are, after a month and a fortnight of brilliance and mediocrity on the field, we have the host nations clashing at the finals. Prior to February 14, the upcoming clash was very much predictable because of the home advantage but the day the WC kicked off, a completely different story. Yet here we are after witnessing 4 top teams compete against each other. Well, one would say that South Africa choked as usual, I would like to believe that the rain played the spoil sport to get a champion team out of the race. All said and done, its not right to take away any credit from the black caps who have played possibly their best cricket till date and surprisingly only one team to come closer to what they have achieved. A team which was almost striked off from the list of favorites by judging their performance over 3 months. Well, that team obviously knew how to answer the criticism and with all elegance they got 6 out of 6 in their league stages. Yes and that’s India. They showed commitment to their goal and carried the aura of being the DEFENDING CHAMPIONS only till that one game which got them all the criticism. Though, India lost the semis, one should not forget that they lost to a better side and with side where a number of players were playing their first world cup. If we objectively analyze the second semi final, India lost half their battle when they lost the toss. This is because its always a mammoth task to chase a target in a big game, however small or big it may be. Secondly, India lost the game when they allowed the partnership between smith and finch to settle down something they had not done in their previous games but I still felt that India did a brilliant job to pull the aussies back after getting some crucial wickets post the 34th over. They made sure that the Aussies did not reach the mammoth total very easily and at a point it felt as if they would get too 295 until Johnson recreated india's biggest fear which is of course the tail scoring runs. Possibly after such cameos it may be wrong to say that Australia do have a TAIL. Johnson bagged those brownie runs which gave them the appropriate score. When we all went into that innings break, we knew that the 329 was humongous for any team to chase but a thought most Indian fans bore in mind was that their batting line up was one of the best in the world. And they were not wrong till the first wicket fell. The openers showed patience and calmness which is a prerequisite in big games like this. But India somehow lost its way when crucial wickets fell and the most spoken of them was of virat kohli. Obviously there was a ray of hope when the rahane and dhoni partnership got going. Indians knew what their captain was capable of but it was just not india's day and Australia got a berth in the finals and the Indian world cup dream ended in a way which saw tears in their captains eyes. Of course, the next big treat for cricket lovers is the upcoming clash at the G and hopefully a cracker too. But before I conclude this article, I would love to deviate from the analysis and speak a bit about the ways people have reacted about india's loss. Number of people spoke about how winning all the matches in the league stage was futile, but I still believe that had India not played the way they did, we would have had been left with so little to be proud of. May be as Indians we all felt the way we did when India crashed out of the WC, but as true fans of the game lets give a thought to some good cricket India played this WC. With that thought, I hope you enjoy the upcoming final. ﻿Its semi finals time and we have reached the most exciting phase of any ICC Tournament, specially the World Cup. The 2015 edition of the mega event did see a few surprises with spirited performances from the associate nations and the shocking group stage exit of England. But eventually, India, South Africa, New Zealand and South Africa, who are the best sides on paper, have made it to the last four. Two very strong One Day International sides, South Africa and New Zealand are ready to take on each other in the first semi final of the World Cup at Eden Park in Auckland. Interestingly, the winner of this match will reach the finals of the World Cup for the very first time in the relatively long history of the most important cricket tournament. For two sides filled with big match players, both teams have been guilty of underachieving. It just puts light on the importance of absorbing and performing under pressure. Here’s looking at the keys to success for both the teams in this all important fixture. Eden Park is one of the largest stadiums in New Zealand with a capacity of 50000. Traditionally, the pitches here have been on the slow side and good for batting. But throughout this World Cup, pitches have been conducive to swing bowling and we have been treated to some amazing low scoring encounters like the one between Australia and New Zealand where the calmness of Kane Williamson guided the Black Caps to a one wicket victory. During this edition of the World Cup, 3 out of the 4 games played in Auckland have been won by the side chasing and so, the team winning the toss will be happy to bowl first. Another interesting fact is that the wickets at Eden Park are “drop in pitches” (information credits- cricbuzz). It is a kind of cricket pitch which is prepared away from the ground and literally “dropped in” to place. This team has always had the potential to go the distance but has always faltered under pressure. They started their campaign as favorites and were pretty efficient in the group stages barring losses to India and Pakistan. They even crossed the 400 run mark twice on the back of magnificent striking from the one man army, AB De Villers. Although they were clicking as a batting unit, their bowling seemed off color until the quarterfinal match against the Sri Lankans. In what proved to be the final appearance in colored clothing for two greats, Sangakkara and Jayawardene, it was the aggression of Dale Steyn backed up by the variations of Imran Tahir that helped South Africa to restrict the Lankan tigers to a lowly 132 before the batsmen helped the team stroll to victory. 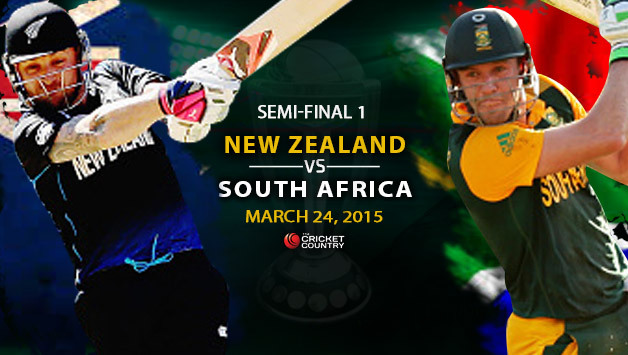 De Villers will be hoping that his boys keep performing well till they lift the World Cup. The Black Caps have always been the dark horses at the World Cup, reaching the semi finals on a numerous occasions and Brendon McCullum knows that this is their best chance of going all the way. The co- hosts justified their reputation as favorites by winning six out of six games in the league stages. All their wins came in a typical fashion, with McCullum getting off to a brisk start and Southee and Boult rattling the opposition with their pace and swing. They have had a simple strategy of being aggressive and going all guns blazing, be it with bat or with ball. It is a risky strategy which almost failed on two occasions (against Australia and against Scotland). In the quarterfinals against the West Indies, Martin Guptill surprised one and all with a stroke filled 237*. McCullum will want to continue the winning streak and be aggressive and positive. 1. Dale Steyn vs. Brendon McCullum- Steyn is currently the most aggressive fast bowler in the world and McCullum is the most aggressive batsman. So, when these two face off, there will be fireworks for certain. 2. AB De Villers vs. Trent Boult- Trent Boult is currently in the form of his life, getting the ball to swing in the air and move off the pitch. So, if there is any bowler who has the greatest chance to get the 360 degree batsman, AB De Villers out, it has got to be Boult. 3. Martin Guptill vs. Imran Tahir- These two players have been the real surprise packages for their respective teams. It will be interesting to see how these two perform in the all important fixture. If South Africa has the experience of Amla, New Zealand has the old fox, Vettori. If the Black Caps have the all round abilities of Anderson, the Protease have the consistent Du Plesis. So, we can say that on paper, both the teams are evenly matched but I still think that New Zealand have the advantage. The most influential factor in favor of the Black Caps is the home crowd. In any sport, home support plays a very important role in boosting their side’s morale in crunch situations. It is also important to note that, New Zealand have played and won all their matches so far on home soil. So I think it will be New Zealand in the finals. What do you think?? Sri Lanka Cricket (SLC) saved the BCCI from incurring huge financial losses by agreeing to send the Sri Lankan Cricket team to tour India on very short notice after the West Indies Cricket team, that was on tour in India for 5 One Day Internationals (ODI), 3 Tests and a lone T20 International, abruptly called off their tour after the 4th ODI owing to a three way dispute involving the West Indies Cricket team, the West Indies Players Association (WIPA) and the West Indies Cricket Board (WICB) over the payment of wages to the players. In exchange for the SCL’s gesture, the BCCI has agreed to send the Indian team for a tour of Sri Lanka in July next year. The series, consisting of 5ODIs, begins on 2nd November in Cuttack, Orissa. The touring party also played a practice game which they lost by a relatively large margin of 88 runs. While the BCCI was overwhelmed by the SLC’s compliance, this development was neither welcomed by the Sri Lankan team’s management, nor by cricket enthusiasts all over the world, as this last minute announcement caused the abrupt ending of the intense fitness program that the Sri Lankan team was undergoing as a part of their preparations for the 50 over World Cup in Australia and New Zealand, early next year. Also, this tour leaves both Sri Lanka and India with virtually no time to prepare for the important series against England and Australia respectively, scheduled next month. Thus, the managers of both teams have rested key players to keep them fit, healthy and fresh for the more important matches the next month. INDIA- The big news from the Indian camp is that Virat Kohli will lead the side for this series (at least the first 3 ODIs) in place of MS Dhoni who has been given a break. Kohli, who came back into form in the last 2 ODIs against West Indies with a half century and a century after a horrid tour of England, will want to find consistency with the bat. There is no other major change as far as batting is concerned, with Wriddhiman Saha coming in as the stand in wicket keeper. The bowling however, sees new faces with Dhawal Kulkarni (coming in place of the injured Shami) to join the pace trio of Umesh Yadav, Ishant Sharma and Varun Aaron. In the spin department, R Ashwin, who had suspiciously been rested for the series against West Indies, is back to the side. Young pacer, Bhuvaneshwar Kumar has also been rested. With exceptional performances in the practice game, Rohit Sharma, Manish Pandey and Karan Sharma have caught the the selectors’ attention and may be included in the side for the final 2 ODIs. SRI LANKA- Captain Angelo Matthews admitted that the Sri Lankan team was ill prepared for this tour and it showed in the practice game against India, where they were leaked 381 runs and eventually lost the game. Their batting looks more or less stable with veterans Sangakkara, Dilshan and Jayawardene at the top of the order and Matthews and Thisara Perera in the middle order. Young Chaturanga De Silva has also been included in the squad. Their bowling however looks toothless without star Lasith Malinga in the pace department and Rangana Herath and Ajantha Mendis in the spin department. While both the spinners have been rested, Malinga has just had an ankle surgery and might be fit only just in time for the World Cup. Thus, in search of an appropriate pace combination, the selectors have brought in Lahiru Gamage who has an impressive list A record with 90 wickets. While India starts as favorites, they should not underestimate the depleted Sri Lankan side because they have a lot of new, unknown players whose potentials are yet to be discovered. Hoping for a competitive series between the two friendly nations…..
'The Big Test', as this series is referred to by the media, has been one of the most awaited series for most Indian Fans. With FIFA and Wimbledon drawing curtains, the next thing on the platter is the England vs India series. Though not an epic rivalry, these nations have always shared historical relations which have been bitter and sweet in its own way. This time again the series has a lot of eyes on it. However, an overseas tour has somewhat been a nightmare for the Indian side. They have more often than not had a bitter relation with overseas test victories. This series is, once again, going to put their integrity to test. Their captain, Dhoni, is going to face a lot of pressure with respect to his record at England. So is the situation with Cook. He has also had a troubled start to his home series against Sri Lanka. He would want to rectify his errors form the previous series. Thus, this series no longer stays one sided. This series has now metamorphed into a TEST UNDER PRESSURE. Whoever handles pressure better could be favourites in here. This summer, India look better prepared. First of all, they have managed to battle the guerrilla of injuries which cost them a series during their previous outing to England. Secondly, their young talent has got a taste of overseas conditions in SA and NZ. And thirdly, their decision to get Dravid on board as a consultant could prove helpful. I mean, whom other than Dravid can describe English conditions better, right? On the other hand, the hosts have suffered a loss against SL. Either they could learn from their mistakes or succumb to the pressure of losing a home series. It is how their team perceives the situation. But what makes this series even more special is the 200th anniversary of Lords, the home of cricket. The elegant stadium has completed 200 years and witnessed a number of historical moments in world cricket. This year, on the 5th of July, the Marlyebone Cricket Club is going to host a match against the rest of world ODI XI. Once again the world is going to witness the greats of the game. It’s going to be a blend of Sachin’s class, Dravid’elegance, Warne’s instinct and many others to be named. It is going to be a treat to our eyes. It will go down our memory lanes to make Lords immortal. 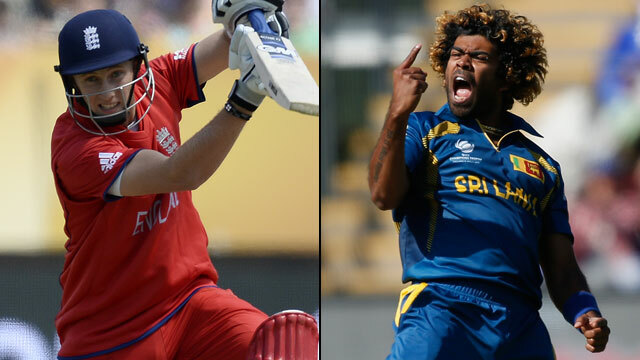 So all written, discussed and analyzed, this season of English cricket promises a treat to the eyes. Like most people's expectations, The Sri Lankan side swept away the tour winning the sole T20 international and taking away the One day and Test Legs 3-2 and 1-0 respectively. But those are just numbers. They don't say anything at all unless you saw the matches or read all the scorelines. England have probably outdone themselves after having a Horrible season before the World T20 which itself wasn't great. The English side have been in the spotlight even before the series started as they prepared for life after KP, Trott and Swann. With new and young players stepping in, the English weren't expected to win anyway. But what they did, was commendable. Ignoring the T20 which seemed like a game played for the sake of it after the IPL and World T20 though it was a very close affair and a highscoring game as the Lankans took it away by 7 runs. The ODI series couldn't have been better. The margins of the series seemed as if the teams had their days. The English won their games by 81 runs and 10 wickets while getting all down for 99 runs once. The Lankans on the other hand won by 7 runs, 157 runs and the final ODI by 6 wickets while getting shot out for 67 runs once. What does this say? Both teams had their days and Sri Lanka had their day going into the final match clinching the series 3-2. Star Performers? The batsmen should get NOTHING for this. 8 half centuries and 2 centuries between 9 batsmen. Pure inconsistency and showed that every inning it was just one batsman carrying the whole team on his shoulders. Dilshan high scored with 222 runs in 5 innings which isn't very good though he was the only one with 2 half centuries. Bowlers? Even worse. Only 1 bowler got more than 10 wickets in the entire series and that was Chris Jordan with 12 wickets. Some might say that it was team work and all of them got the wickets together but frankly, only 3/4th of the wickets fell in the entire series so that simply means that it was all round scoring from the batsmen and not much from the bowlers. Jos Buttler was the surprise package of the series. Scoring a century and other small knocks coming in at No. 7, he is taking his role very seriously and well for the English. The Test series was a similar story when it came to results. Both tests went very close with England missing out by a wicket as the first test went draw and Sri Lanka picking up the last English wicket with a Ball to spare after heroic efforts from Jimmy Anderson scoring nothing from 55 balls, just standing there at the crease. The test series was enjoyed by both batsmen and bowlers with the Batsmen getting 7 centuries and 11 half centuries in 8 innings while the bowling unit picking up 75 of the available 80 wickets. Stars? Sangakkara is still the go to man for Sri Lanka. Scoring more than a half century in all 4 innings, he top scored in the tournament and produced some wonderful knocks in his last games for the Lankans. Jimmy Anderson on the other side picked up the bowling plaudits with 12 wickets grabbing a 5 wicket haul and leading the English quicks from the front. There were many surprises too. 160 and 4 wickets from all rounder Mathews, centuries from Balance, Ali and Robson. Rise in the form of Eranga while the return of Liam Plunkett, this series had it all that you need to understand the importance of Test Cricket. What went horribly wrong? Alistair Cook. The English Captain had a tour to forget. With just a half century in the 4th ODI, Cook had nothing to offer in the entire tour than his captaincy. It is high time that he performs or it wouldn't be just Shane Warne criticizing him but probably the ECB as well. What Ahead? Its India against the English and with the young English guns performing well, it seems that the Indians will have some contest as they look for revenge for 2011.